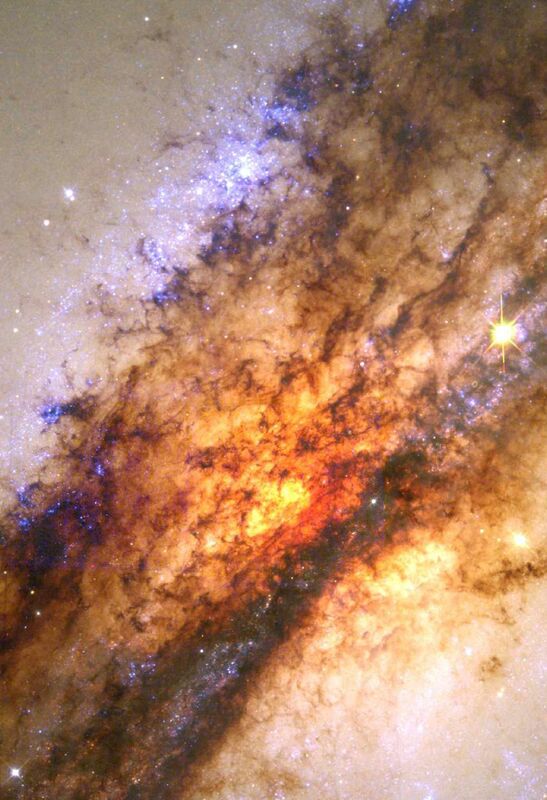 Hubble Space Telescope offers a stunning unprecedented close-up view of a turbulent firestorm of starbirth along a nearly edge-on dust disk girdling Centaurus A, the nearest active galaxy to Earth. A ground-based telescopic view (upper left insert) shows that the dust lane girdles the entire elliptical galaxy. This lane has long been considered the dust remnant of a smaller spiral galaxy that merged with the large elliptical galaxy. The spiral galaxy deposited its gas and dust into the elliptical galaxy, and the shock of the collision compressed interstellar gas, precipitating a flurry of star formation. Resembling looming storm clouds, dark filaments of dust mixed with cold hydrogen gas are silhouetted against the incandescent yellow-orange glow from hot gas and stars behind it. Brilliant clusters of young blue stars lie along the edge of the dark dust rift. Outside the rift the sky is filled with the soft hazy glow of the galaxy's much older resident population of red giant and red dwarf stars. The dusty disk is tilted nearly edge-on, its inclination estimated to be only 10 or 20 degrees from our line-of-sight. The dust lane has not yet had enough time since the recent merger to settle down into a flat disk. At this oblique angle, bends and warps in the dust lane cause us to see a rippled "washboard" structure. The picture is a mosaic of two Hubble Space Telescope images taken with the Wide Field Planetary Camera 2, on Aug. 1, 1997 and Jan. 10, 1998. The approximately natural color is assembled from images taken in blue, green and red light. Details as small as seven light-years across can be resolved. The blue color is due to the light from extremely hot, newborn stars. The reddish-yellow color is due in part to hot gas, in part to older stars in the elliptical galaxy and in part to scattering of blue light by dust, the same effect that produces brilliant orange sunsets on Earth.